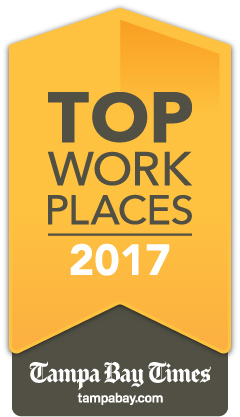 Tampa, FL (April 10, 2017) – Baldwin Krystyn Sherman Partners, one of the largest independent insurance brokerage firms in the U.S., has been named a Tampa Bay Times Top Workplace 2017, for the sixth consecutive year. WorkplaceDynamics surveyed 175 organizations that agreed to participate in the survey process. Those surveyed firms employ 89,324 people in the Tampa area. Of those employees who received questionnaires, 37,058 responded, either on paper or online. This year, 100 Tampa-area employers scored high enough to earn Top Workplaces honors.